REMOJADAS STYLE, CLASSIC, CA. A.D. 450-650. Height: 7 in. (17.8 cm. ); Length: 4.2 in. (10.7 cm.). Provenance: Acquired from an old Los Angeles, California collection formed during the 1950s-‘60s. 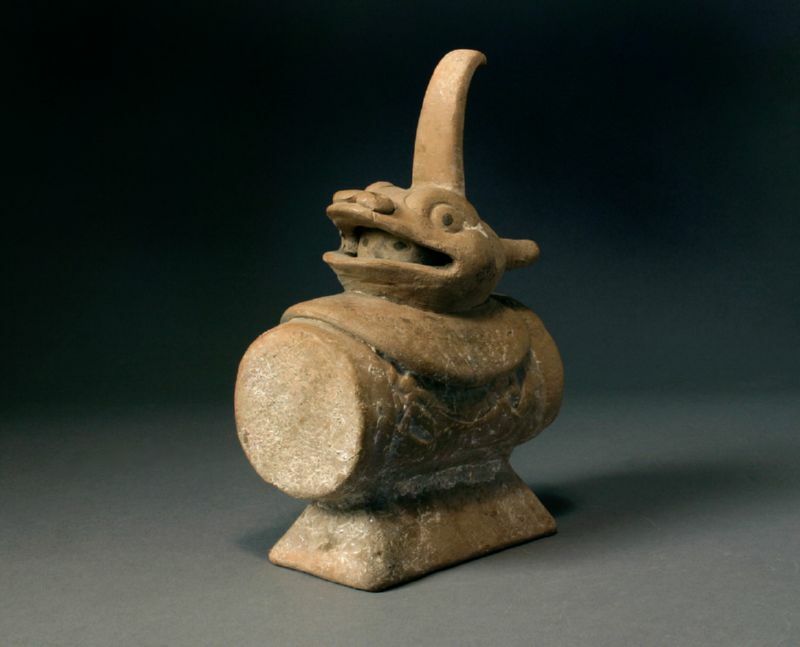 This cylindrical drum with multiple effigy decorations carved in relief features a dragon-like creature’s head with curling finial at the top, as mask with a human face peering out from within the open mouth. The mask’s curved platform rests attached to the drum, which is in turn attached to a trapezoidal pedestal. The monster’s nostrils are appliquéd, and the two sets of eyes are pigmented with chapapote, or bitumen. Minimal remains of white pigment are apparent overall, as well as ancient encrustations and root markings.